What's going on with work permits in Cambodia? They’ve extended the deadline for work permit applications until April 30th. This is handy because they never officially announced the previous deadline. Unfortunately, the extension does not include an amnesty for previous years’ fines as it did in 2017. They have also announced that employers will be fined $630 for employees who do not have a work permit and employees will be fined $10 per day for overdue work permit extensions. So if you haven’t gotten a work permit, now is probably the time to do it. The cost is $100 per calendar year that you have had an EB visa (formerly the “ordinary” or “business” visa) and $100 for the current year. If you work for an employer, they need to have applied for a quota for foreign workers. If your employer neglected to do this, you will need to apply as a self-employed worker. Those who are self-employed report that their applications are being rejected multiple times for not having a business license. Those who persevere have reported that on the fifth or tenth attempt, they have gotten approved. So keep trying. If you are self-employed, do not list a business name or they will (understandably) request a business license. Those who have been approved report entering “freelance/freelance/salary 0/category X (other) 100 (other)” on their application. I can’t keep up with the changing work permit information or with emails I get from readers asking for advice on their situation, so if you have questions or need updates, please visit the Cambodia Visa and Work Permit Group on Facebook. The deadline to apply for a 2018 work permit is either the end of March or the start of Khmer New Year (April 14th). Both have been reported, so take your pick. If you applied last year using the online system, you can login using the same username/password and click “renew.” You’ll need to provide a new “physical aptitude certificate” and a copy of your current visa, but other than that, everything will be saved in your application from last year. If you’re in Phnom Penh, you’ll need to get your health certificate from the Ministry of Labour and Vocational Training. Go early in the day and do it soon; it can take up to two weeks to get your certificate. The cost is $25. If you’re in Siem Reap you can get one at Neak Tep clinic in less than an hour for the same price. New, unofficial and often contradictory memos about immigration and work permits are being released by the various ministries on a near-daily basis. Today, it’s being said that you cannot get a 6- or 12-month EB visa extension even if you have a work permit, and will need a letter from an employer. For those who are self-employed, they need a residency letter from immigration, letter from police, and three months of bank statements to show they can support themselves. Unless your visa needs to be renewed this week, I would suggest waiting for the dust to settle. It’s clear that they haven’t decided what the “rules” are or how they will be enforced, so there’s no point in getting into a panic today, because the information may be entirely different by tomorrow. I’ll update this post once something more substantial is released. As reported in the Phnom Penh Post, from the start of the month work permits are now needed to renew most 6- and 12-month EB visa extensions. (EB visa extensions are the ones that most expats are on, also called the ‘ordinary’ or ‘business’ visa.) Although there has not been a government announcement, the new rules are already being enforced. Wondering if there are any exceptions? Keep reading. Sorry to be the bearer of bad news, but you’re going to need a work permit. Those who want to to extend their 6- or 12-month EB visa need to bring a copy of their work permit with them, which will then be submitted with their passport to the Ministry of Immigration. If you do not yet have a work permit you can bring a formal letter from your employer, which should include your full name, passport number, job title, and dates of employment. Letters must be signed and stamped. “The stamp is important. Required,” one agent told me. She also said that before issuing the visa they will check to make sure that the company issuing the employment letter is registered in Cambodia, and presumably, has the quota available to hire foreigners. The names of dependent spouses and children, along with their passport numbers, should also be included in this letter. Non-working spouses and children can be granted an EB visa without a work permit if their name is included on the employment letter of the employed spouse. Work permit application receipts or evidence of application will not be accepted in lieu of a work permit, so if you have already applied but haven’t gotten the permit back, you will need a letter from your employer. This, of course, leaves self-employed people who have already applied for a work permit but have not yet been approved in limbo. The Post article says “the law did not specifically address freelance employees but that the department would try to accommodate them,” and requested that self-employed people provide evidence of self-employment (good luck figuring out what that means). The second exception is that at the current time, a work permit is not required for 1- and 3-month EB visa extensions. Before you get too excited, these visas are single entry, so you will need to get a new one every time you re-enter Cambodia (so they take up a lot of passport pages). And, a little bird at the embassy told me that this is not a permanent solution, because they will not continue to issue even short-term visa extensions indefinitely to someone without a work permit. It’s a temporary reprieve, nothing more. Your next question is probably going to be “where can I find an agent to process my work permit?” The answer: you don’t need one. The Cambodia work permit system has been designed for foreigners to apply online directly, without an agent. Agents who are offering to help people with “difficult” applications should not be trusted. So…take a deep breath and apply for a work permit on your own. It’s not that difficult. If you are a business owner: You must register your business, get a tax patent, and employee quota registration. The quota registration is what allows your employees to apply for a work permit. If you have not applied for this, your employees cannot get a work permit. If you are an employee: You can apply online. You will need to submit a residency certificate which you can get from the immigration police (bring a few passport photos and a copy of your lease), your first long-stay visa from when you entered Cambodia, your current long-stay visa (extension of stay), a passport photo, a medical certification. In Phnom Penh the medical test can be done at the Ministry of Labor clinic, and in Siem Reap several private clinics such as RHAC or Neak Tep and issue the certificate. If you are self-employed (or your employer has not registered): You can also apply online; there is a separate login for the self-employed. You will need all of the information above, minus the employer information. If you are a freelancer, you should enter “freelance” as your occupation and employer and your salary as zero. Most have had their work permits approved with no business certificate or letter, but others have been asked to provide a business registration. If asked, you can try to resubmit the application with “freelance” as your occupation and it has a decent chance of being approved the second time around. After applying, once you’re approved you’ll get an email with an invoice that needs to be paid in riel at any ACLEDA bank. A few weeks or months later, your work permit will be mailed to you, or to your nearest post office where it will be waiting for you. A small caveat which is that these rules, which are being enforced and have been confirmed to me by several travel agents and an embassy employee who met with the Ministry of Labor about it, have not been officially released or included in any prakhas or sub-decrees. So as per usual, this may change. For more information on Cambodia visa types and the requirements for each, check out our All About Cambodia Visas page. Still have questions? Join the Cambodia Visas and Work Permits group on Facebook and ask other confused people questions. If you’ve been following the news lately, you’ll probably have heard the rumors that in a few days Cambodia will be requiring a work permit in order to renew long-stay EB visa extensions. Although there have been several articles in the Phnom Penh Post and the Cambodia Daily, to date, nothing has been confirmed. According to the reports, work permits will be required to renew 6-month and 12-month EB visa extensions, but a work permit will not be needed to renew single-entry 1-month and 3-month extensions. It is rumored that at least for a while, foreigners will be able to submit a letter from an employer in lieu of a work permit stating their intention to procure a work permit in the immediate future. Many websites and agents are pretending that this requirement is a certainty starting this month, however none have actually confirmed this with the Ministry of Immigration, who have only given answers that waffle on about what the requirements are and when they will be implemented. Expats are getting themselves into a sky-is-falling tizzy over what may be nothing (at least for now). Remember, in 2015 it was reported in the Cambodia Daily that the work permit requirement would be strictly enforced, and the Khmer Times reported that those without work permits would be fined at the airport. Neither of these things came to pass (and as the Cambodia Daily didn’t get work permits for their foreign employees, even they didn’t seem to have a lot of faith in their reporting). It is my personal opinion, based on past history, that work permits being required to renew long-stay visa extensions will not be implemented immediately or another work permit amnesty will be offered. It also appears that the prahkas regarding visas will need to be amended to implement the work permit requirement legally, which will take time (whether they do this at all is another story). That said, it is very clear which way the wind is blowing. 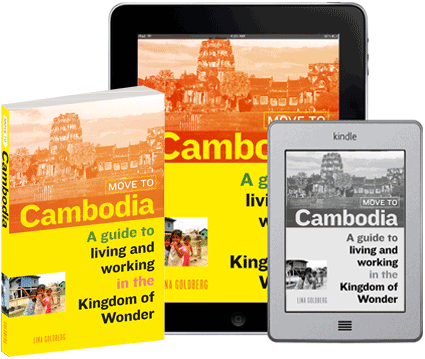 Cambodia no longer wants expats who are not working or are otherwise undesirable. No amount of expat whining and complaining will change that, so for those who are here it’s best to figure out a way that you can qualify for a work permit. At the current time it is still possible for self-employed expats to apply, but that may change in the future. Another rumor that has not been confirmed is that the ER retirement visa extension has strict age requirements. This is not true, although it may be in the near future. Foreigners in their 40s have successfully applied and been granted the ER retirement visa extension. In conclusion, you probably need a work permit and the sooner you deal with it, the better. Please see the previous update for information on applying for a Cambodia work permit. A real life Cambodia work permit (pre-2017 style). First, the regular E-type visa has been split into several sub-types. (Read all about them here). For those who are on the most common type, the EB visa, you are required to have a work permit. 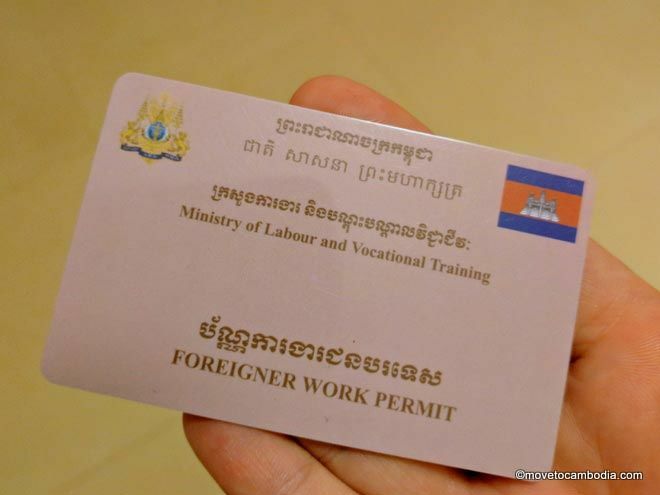 Right now the requirement is not being enforced across the board, so many foreigners in Cambodia do not have work permits, and many will say they are not necessary. I have begrudgingly come to the conclusion that the work permit issue is not going away, and that everyone who is working in Cambodia should become compliant. If you are an employee: You can apply online. You will need to submit a residency certificate which you can get from the immigration police, your first long-stay visa, your current long-stay visa (extension of stay), a passport photo, a medical certification (the test consists of getting your temperature taken, a blood test if you are in Phnom Penh, and for women in Siem Reap, a surprisingly thorough breast examination). If you are self-employed (or your employer has not registered): You can also apply online; there is a separate login for the self-employed. You will need all of the information above, minus the employer information. If you are a freelancer, you should enter “freelance” as your occupation and employer. Some who have registered as self-employed have been required to register themselves as a business, or to get a letter from a government ministry stating they are self-employed (which is obviously impossible). Others have had their work permits approved with no business certificate or letter. Unfortunately it appears that they are not very well equipped to deal with the self-employed yet and the process can be onerous. Very few countries allow work permits for freelancers, and it appears that Cambodia may go that way as well and require everyone to register as a business. If you apply for a work permit you will be required to pay for every year from your first E-visa, whether you were working or not. This is not negotiable anymore. The cost for a Cambodia work permit is $30 for a medical certificate, $100 for each prior year, and $130 for 2017. Once your application is approved, you will be sent an email confirmation and asked to make payment at an Acleda Bank. If you let your work permit lapse the fines can be substantial, although how substantial is still unconfirmed. I have heard around $650 or $10 per day (plus the cost of the work permit) but this has not been confirmed. All of the above information is not set in stone and can vary from person to person, town to town, etc. Some people have a smooth and painless application, others do not. I’m sorry because I know this is not what most of you want to hear. It is my belief (uncorroborated, admittedly) that at some point in the not-so-distant future they will tie work permits to immigration status and those who do not have them will not be able to get visas or re-enter the country. Whether that actually happens remains to be seen, but the last time I flew into the country I was asked by the immigration officer if I was working in Cambodia…seemed like a precursor of things to come. For more discussion on what’s happening with work permits, have a look at the Cambodia Visa and Work Permit group on Facebook. A few new developments with work permits in Cambodia. The government has announced that tomorrow, September 1st, they will be launching online work permit applications for foreigners. If the site actually works, this seems like great news because the rules will have to become clear (mostly), and people will stop being taken advantage of by dishonest agents, which seems to be happening quite a bit in Phnom Penh and Kampot. The costs will be streamlined, although there is an extra $30 fee paid to the company contracted to process the applications, and a health check-up will be required. Additionally, applicants are required to submit their work contract and certificate of employment. I’m going to take a wild guess that this means employees are going to be required to pay taxes in the future. Overall, although the process is onerous, being able to keep track of foreign workers is probably in Cambodia’s best interests. I guess. The site is up and running but has several glitches that render it unusable. The registration form is worth having a look at, though. It’s been announced today that Cambodia will begin to offer a retirement visa that waives the work permit requirement for retirees. Read our full update about the Cambodia retirement visa here. Since my last update, not much has happened in the work permit world. Most expats do not have work permits, and the crackdown seems to have ended. The only foreigners who have been required to get work permits are those working at large businesses and schools, although there are periodic crackdowns in areas with primarily foreign workers, such as Koh Rong. For the time being, there does not seem to be reason to worry about the issue. Several readers have sent me this article from the Khmer Times on July 30th stating that those without work permits will be fined at the airport if they attempt to leave the country. No one has reported having their work permits checked at the airport, including people I know who have departed Cambodia this week. I do not consider the Khmer Times to be a credible source of information, and until I see it reported elsewhere, I will assume that this report is not based on anything real. Although there is not a lot of news to report on the work permit front, I thought I would update this post with the current situation, ie. the current rumors. After applying for a work permit at the start of the year, I finally got my work book five months later. I used SmartUp Cambodia, based in Siem Reap for my permit. The fee for this service was $60 in addition to the $100 per year for the permit. Remember, the year means calendar year, so even if you arrived in December of 2014, you’ll need to pay for 2014. I have heard reports of agents in Phnom Penh asking hundreds of dollars for processing work permits. Do not pay an exorbitant rate! Using an agent was helpful, but if your application is straightforward, it’s not necessary. The real benefit to using an agent is that they can help negotiate you negotiate a lower price if you’ve been here a long time — think 10+ years. If you’ve only been here a few years, you’re going to pay $100 per year; I haven’t heard of anyone paying less. You can apply yourself by going to the Ministry of Labor. They do not seem to be enforcing with the fervor that they were earlier this year and only seem to be focusing on low-hanging fruit, large companies with several foreign staff. The reason for the lack of recent action might be because they are backlogged with applications, so it’s likely the crackdown will start up again, eventually. However, the alleged list of foreigners that were going to be hunted down and fined seems to have been shelved. If you have a public facing job, it makes sense to get your work permit sooner rather than later. If they (and by they, I mean the Ministry of Immigration who are doing the enforcement for the Ministry of Labor) show up at your place of business and demand to see your work permit, you will be forced to get one, plus pay a $125 fine. There is still a lot of confusion about what the laws mean and how they should be enforced. There have been reports of people being stopped on the street and having money demanded if they could not produce a work permit, but I suspect that these are just rogue officers asking for bribes. If you are confronted in this way, just refuse to pay and head to the Ministry of Labor to apply for your work permit. You’ll be given a receipt that you can keep while you wait for your actual workbook and card. The cost will be $100 per year, plus an extra couple of bucks to have someone help you translate the forms. Everyone who reports doing it themselves says it is simple and painless. The situation for the retired and volunteers is still up in the air. Personally, if I was a member of one of these groups I might take my chances, because I still think it’s possible that once the laws are clarified (and they are still very, very unclear) that there may be a retirement visa or an agreement that those not drawing a salary in Cambodia will not need a work permit. Overall, the situation does not seem as dire as it did in the previous update below. All foreigners on long-stay “ordinary” or “business” visas need a work permit, regardless of their actual work status. Those on NGO visas are exempt. In the future, retirees may have a special visa, but for now, they need a work permit. Employers are responsible for obtaining a work permit for their employees, but in practice this is not always happening. If you have a formal employer, you should speak to them about your situation. Business owners, the self-employed and freelancers need a work permit, but they can sponsor their own. Technically you need to register your business (and get your taxes set up) to do so, but you can start the work permit process before actually completing your business registration. If you’re self-employed without a visible business, it’s likely that you will be able to avoid the requirements some time while they look for more visible foreigners. However, it’s my personal opinion that the requirements are going to get more stringent and it will be harder to get a work permit in the future without a “real job.” Therefore it may make sense to bite the bullet and do it sooner rather than later. In many cities, businesses that employ foreigners are being told they must get work permits. If you wait until you are asked for one, you will be fined $125, plus the regular costs. Therefore, it makes sense to get your paperwork in order before you end up on their hit list. Those who apply for work permits are required to pay $100 for each calendar year from their first long-stay visa. This means if you arrive in September, 2013 and apply for a work permit today, you will need to pay $300, for years 2013, 2014, and 2015. Most long-term expats are able to negotiate a lower rate — it’s been the case that they will generally settle for 5 years ($500) regardless of the length of your actual stay. Previous (French) reports of them waiving the back years entirely have been unsubstantiated. Although a residence card is also required, they have not started issuing them yet. Another requirement is that foreigners submit to a blood test each year, to test for unspecified communicable diseases. A fee can be paid to avoid the test, and if you, like I, are terrified due to the recent HIV outbreak in Battambang that was quite possibly deliberately spread by a local doctor, I would just pay the fee. It’s important to note that at the current time, work permits are not tied to visas. So even if you are on a “business” visa, you do not have a work permit. Moreover, it’s an entirely different department that is is issuing work permits than the one that issues visas. This means that even if you do not have a work permit, you will be able to renew your visa at a travel agent (but not at the immigration office), and you won’t be stopped coming in to or leaving Cambodia if you don’t have a work permit. For now. There are a number of businesses and consultants offering to do the work permit paperwork for fees ranging from $20 to $60. I’ll get a list together if anyone is interested. I’m testing out SmartUp Cambodia in Siem Reap, and will let you know in 4-6 weeks how it goes. Don’t shoot me, I’m just the messenger. It’s possible this will all blow over as in years past, but personally, I don’t think it will. In today’s Cambodia Daily, there’s an article entitled Work Permits Now Required for Foreigners. 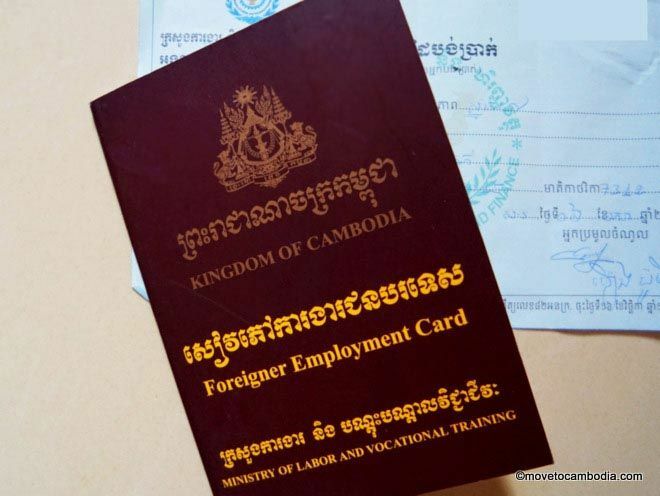 “The Labor Ministry has begun to enforce a long-neglected law that requires foreigners employed in Cambodia to have work permits, according to ministry officials. Teams of inspectors have begun scouring the country to ensure that foreign employees and businesspeople have the proper documentation, with employers and workers facing hefty fines in the event that they are not certified.” The article also mentions large retroactive fines and payments for prior years. Elsewhere, the French Embassy has been advising its citizens that they should get work permits, but pay for 2014 only, ie. no retroactive fines for previous years. In Francophone Cambodge Mag, Anthony Galliano of Cambodia Investment Management reports back from his recent meeting with the Ministry of Labor. He reports that they have clearly stated that volunteers, retirees, and the unemployed will not need work permits. Anyone drawing an income in Cambodia will need a work permit from a registered business. If you are a shareholder in a licensed, registered business, you do not need a work permit. If you are self-employed or are a shareholder in a non-registered business, it would behoove you to register your business, although it seems unlikely that the self-employed will be one of the first groups targeted. Galliano suggests using this reprieve as a chance to quietly get all necessary paperwork in order. The Cambodia Daily has published an article saying the Ministries of Labor and Interior “met on Thursday to outline the government’s plan to more strictly enforce measures for employers of foreign nationals to ensure that their staff has proper documentation.” It looks like they will be asking all employers to get work permits for their employees. There is no mention of any other class of visa holder such as volunteers, self-employed, retirees, etc. You may have heard that the situation with Cambodia work permits has changed recently. That’s half true. In order to work in Cambodia, one has always needed a work permit. However, it was very rarely enforced and the great majority of people didn’t bother. In the last few weeks, however, there have been several announcements that the work permit requirement is now going to be enforced. First, this announcement has happened every few years for a long, long time. Most of the time, they crack down on a few expats and then the issue is dropped. This time the threats seem more serious, but it is still very much up in the air. There have been a few crackdowns this year, most notably in Kampot, but nothing has changed yet for the great majority of expats in Cambodia. It appears that if you work for a company in Cambodia you will, at some point in the near future, need to get a work permit. They are going after the largest and most visible companies first. 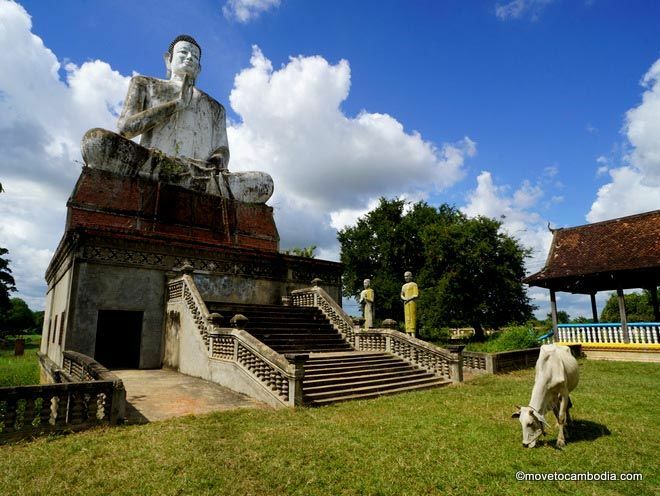 Expats who have been in Cambodia the longest have the most to worry about. Work permits cost $100 per year, and they are checking passports and counting how many years you have in Cambodia and charging for the previous years. They also add fines into the mix–which are, of course, not listed in the prakas and are subject to the whims and financial solvency of those collecting. This means that those with newer passports will pay less. Thus far, it seems that Kampot has been the only city to be seriously affected. Even in Kampot, while many people were told to get work permits, many more were ignored. In other cities, there have been reports of police going door to door asking foreigners for a copy of their passport and visa. It’s possible that this is a prelude to a work permit crackdown later in the year, or it’s possible that the sangkats are just getting their records up-to-date, as they are supposed to keep track of where all foreigners live, anyway. At the present time it is the employer’s responsibility to secure the work permit for their employees, although this may be changing. Any foreign employee of a registered business will need to get a work permit, although there is probably no need to do it until the Ministry of Labor demands it. However, many large employers are finally getting the message and registering their foreign employees, so you may be one of the lucky ones that gets your work permit quickly and without any hassle. It’s important to note that at the current time, work permits are not tied to visas. So even if you are on a “business” visa, you do not have a work permit. Moreover, it’s an entirely different department that is is issuing work permits than the one that issues visas. This means that even if you do not have a work permit, you will be able to renew your visa, and you won’t be stopped coming in to or leaving Cambodia if you don’t have a work permit. And then there’s the residency card. According to the prakas, foreigners need a visa, work permit and residency card. Thus far there has been no proof that any residency card has ever been issued to a foreigner, so for the moment, this point can be ignored. But I’m a volunteer, retiree or unemployed?! The status of volunteers, retirees, the unemployed is still very much up in the air. Work permits may be required for all holders of long-term visas. However, a recent visitor to the Ministry of Labor says that those not drawing a salary in Cambodia will not be affected. Probably nothing. This may, as it has many times before, blow over. If you work for a large organization, your employer will secure a work permit for you. If you work for a small organization, it’s likely that you will not be asked for a work permit for at least a while. It is my personal opinion that marching into ministries and waving cash around trying to solve problems that have yet to be clarified or put on paper is a bad idea. So I wouldn’t advise doing anything until the rules become more clear, unless your employer has already brought it up. These rules have been on the books since 1995, and there’s nothing wrong with Cambodia finally deciding to enforce them. Of course it’s not ideal that are choosing to retroactively punish expats for not having work permits when it was often not possible to get work permits in years past. But it’s important to remember that Cambodia, even with an extra $100 a year tacked on for a work permit, still offers one of the easiest and cheapest visa/work permits in the world. This is all of the information that is available to date. Clear as mud, right? Remain calm and let’s see what happens. We’ll update this blog if anything changes. Looking for more information? Check out our page about Cambodia visas and our page about Cambodia work permits. This entry was posted in Expat Life, Practicalities and tagged work permits. Bookmark the permalink. 161 Responses to What’s going on with work permits in Cambodia? So no more freelancing in Cambodia without leaving too often? No, it just means you have to keep resubmitting your application until they approve it. Hello, just a quick question. We arrived in Cambodia last August 2017. Got the eb 3-month eb extension twice. Last January 2018 we left cambodia. Last Feb 2018 we got back in Cambodia — now with a 3 months eg extension. Do we need to pay for last year’s work permit? We will leave Cambodia this June and will most likely not be returning for awhile. Will we get fined as we leave the airport? I was confused and just heard that not paying for work permit will have a penalty of 10usd per day.. will we pay 10 USD per day for our stay here from August 2017 to Jan 2018? I know it doesn’t matter, but we don’t work here. And foolish for us to sort of let this whole thing get passed us.. looking forward to your reply. thank you in advance. This will not apply to all as I am retired. I did go for an annual visa renewal today. They did ask for a letter from employer and work permit. I said, I am not working. Cost up from $290 to $302. Now wait. Because of KH New Year takes longer then normal. Correct. You do not need a work permit if you are on an ER visa, only for an EB visa. Hello, thanks for the link and quick response. I don’t have Facebook though :( will find a way and manage. Thanks once again. Question about the 2018 WP deadline. Does it mean that I won’t be able to get a Work Permit after this deadline? My intention was to arrive to Cambodia in April and, then, ask for the Work Permit and register as a sole proprietorship to legally do my work as a freelance working for companies located outside Cambodia. I guess that am confused as to which cases does this deadline apply. The deadline is for people who are already in Cambodia on an EB visa. If you don’t arrive until April, you can register your business then and apply after you’ve registered. Hi – thanks for all this very helpful information. I have a couple of questions, as I am currently deciding whether to take a job with an employer or go freelance. Do you mean you pay the fee directly to the department issuing the work permits and just skip the medical to avoid the risk of communicable diseases? Thats officially allowed? Also, what about if i have an employer. If they are seeking a work permit on your behalf, do you still need to get a medical done for them? Hi Billy, everything with work permits is in flux at the moment, so you should check the updates on the Facebook page. Hi, Lina! Love your book and recommend it regularly in the Facebook community about visas and work permits. I just saw your 11-October update, and I have a question: I got my first 12-month EB in late August but I’m freelance and have not yet applied for a work permit and I’m traveling out of the country in early November. I’d rather not spend the money on a WP that apparently won’t do me any good (per your 11-Oct update), but I don’t want to be fined when I re-enter Cambodia at the conclusion of my November trip, either. Any advice?